Its been a long wait for me to take my first car. I did not take a car for a long time not because I could not afford, but wanted to take a good car which I can keep for a longer time. Most of the entry cars do not provide all the features and are not safer. So my wait for a good car was quite long. It’s been nearly two months since I started my car for my first car. And today (May 2010) I am happy to say that I got a ‘Mini tank’ . Yes a ‘Mini Tank’ , that’s the simplest way to describe my car, Skoda Fabia. Today I am a proud owner of Skoda Fabia Classic 1.2 HTP. I loved Skoda cars from a long time, but always thought they were out of reach hence Skoda never came to mind when I started my car hunt. Also a lot of negative reviews of Skoda in Team BHP kept Skoda was away from my wish list. My first love was VW Polo, but due to the long waiting period of 4/5 months it made me to drop the model. So started checking out other models like Fiat Punto, Ford Figo, Maruti Swift, etc. And I did check out most of the hatchbacks in the price range but Skoda was still unchecked. Visiting Skoda was just a coincidence, I was on my way to a Tata dealership from VW dealership on a Sunday and on the way saw the Skoda showroom, my better half said let’s check out that. Though I had reservations to check it after reading the reviews in Team BHP. I thought let me at check out and find out the truth of reviews of Skoda. After checking almost all hatchbacks Fabia was one thing which left out. I had low expectations from Skoda dealership, but the dealership experience came as a big surprise to me. The sales executive explained in detail each and everything, he took almost an hour explaining and answering my queries, that’s just great till now no showroom sales guys had such a deep knowledge of the product and were giving so much importance to the customer. This actually started changing my negative impression of Skoda. They seem to be better than most of the dealers, in Bangalore at least. Now coming to my ‘Mini tank’ . 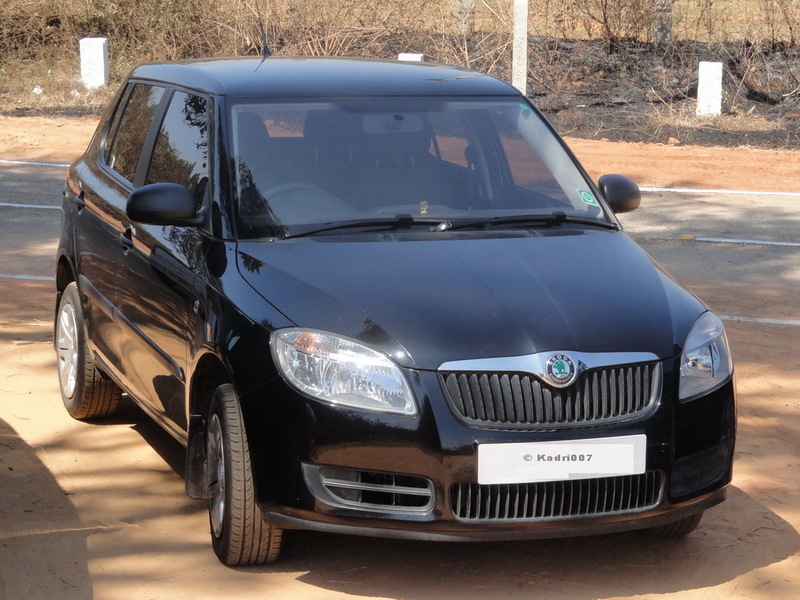 Fabia is a simple but tough vehicle, its safety features are no match at Rs 6Lakh budget. The build quality, fit and finish are just amazing. It just looks elegant. My heart started beating towards it. And then the sales executive tells me that there is a 50000 discount going on. That was wow, but it was still out of my budget. Still somewhere the negative reviews were popping up in mind. The battle between Heart and Mind had begun. 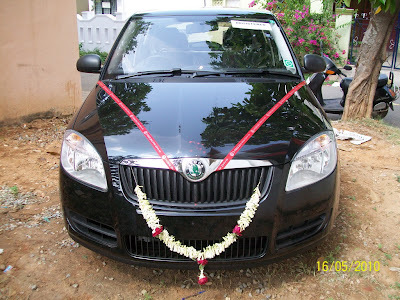 For some time again Fabia was in one corner, but when Ford Figo failed my expectations after TD, things changed. It was a battle between Fiat Punto and Skoda Fabia. Initially I read Skoda service was too costly. So called the customer care and checked out, they sent me a detailed service charges and spares details like how Fiat and Ford is giving. The annual service cost at first looked high. But hold on, the service cost if for 15000 KMS interval or 1 year service interval, that’s just great. There is a catch in the annual service cost which most of the mass brands take it to their advantage. If you look at the service cost of Maruti, Tata, Hyundai their service intervals are at 2K,5K and 10K KMS in a year and it may cost you around 3K each which means annually you will end up paying 9K for service, but for Fabia the service cost is around 8k. In short the annual amount of service is almost the same like any other model. I think it’s time for me to write a detailed review because initial excitement of buying a car has come down and now since I have completed 6 Months of my driving Fabia and clocking around 7000 KMS, it would be much useful for others to know how is the actual Skoda Fabia . Most of the magazines and automobile websites give a fancy picture of any car. But here is the actual reality. One tip for New car buyers, always ask the actual car owners on how the model is, most of the dealers give fancy pictures. Always take your own time, check out everything before deciding. When I decided to take Skoda Fabia , there was a lot of negative reports of Skoda and many advised not to go for it, but today I can say Skoda products are not at all a bad the way it is being portrayed, the brand name of Skoda in India is low mainly because Skoda management had not taken corrective steps during their initial entry to India, but now I feel things are changing after the parent company also has come into India, the Volkswagen. 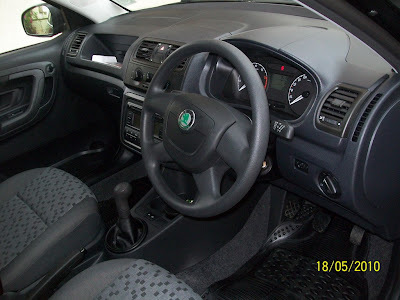 I planned to take the risk of taking Skoda keeping in mind its quality and Safety features which I didn’t find in many other cars, the quality is what keeps Skoda apart from rest of the lot. Coming to the driving, most of my driving during weekdays has been in Bangalore city in peak hour traffic. My daily travel is around 60KMS because I stay and work at two different ends of city. Since I like driving I enjoy it, but sometimes the slow moving traffic of Bangalore City makes me sleepy. Wait but there is good entertainment in Fabia through its FM Radio and CD Player. The sound quality is very good, the audio system comes in-built from Chez. Even though my Fabia has two speakers its equivalent to 4 of some of the Indian makes , it’s quite powerful. Once you close the windows and put the air condition on, you just can’t make out the outside sound. All the horrible auto rickshaws sound all die out and I get my peaceful life back. Driving in Bangalore is a pain in peak hours since you need to change gears often. Like any European cars, the speeds are lower in first two gears, it doesn’t zoom like Japanese cars in first gears. But practically this system works well for Indian roads and slow moving traffic. Fabia is quite heavy and it’s like a mini tank and you need to change to first gear when it becomes very slow. Its gear ratios are a bit different than Indian cars where you can press half clutch and move on in the second gear. Wish Skoda comes up with a Automatic transmission version of Fabia, then it would be easier to drive in traffic. Ground clearance is good. But need to be slow and change to 1st gear while passing humps when 5 people are on board. But Bangalore has some of the uncivilized humps which are just like mini mountains and not even marked. On the highway Fabia is a gem to drive, you just don’t feel the speed if roads are good. And Fabia sticks to the road well. The braking is excellent despite of the base model not being a ABS. And you feel a lot safer because of the built quality and excellent safety features. On the fourth and fifth gear the car can easily compete with any high end SUV , it’s a very good car for long drive, plenty of luggage space also. 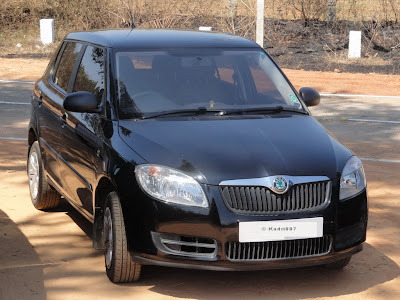 I have driven in some of the worst roads in Karnataka, you can see the Horanadu photo gallery on the road condition, Fabia can take on any road with ease. Its high beam head lights are very powerful. Performance in highway is excellent even on hilly terrain you can easily drive. I even touched 145KMS speed in a few good stretches of Belur- Hassan highway, its similar to Mumabi express way. Fabia is very stable at high speeds and sticks to the road in sharp turns. The advantage of taking any European built car is its safety standards and high quality standards. But negative part is fuel economy, I am getting 11 KM mileage in city and 14 in highway. But driving comfort is excellent and feel safe so some where you need to balance between Fuel economy and Safety. If you are looking at fuel economy and style you can go for any Japanese car. But they are very light weight and safety features are less when compared to European models. American models have not impressed me till now, but it’s better than Indian makes. Indian Makes are good value for money because you get good space, good fuel economy at a very competitive price. But Safety and quality is not of international standards. For city drive Indian cars are very good and these can be rough handled, but European cars are not sport cars like Japanese and requires gentle handling . The above mentioned review is purely based on my personal experience.